Trying to stand out on an app with over 600 million active users is never going to be easy. However, with the evolving Internet world and the increasing need to generate engagement there is only one answer: hashtags. Hashtags have become a huge part of Social Media and a feature that near enough every regular Twitter and Instagram user is joining in with. They create trending topics and network-wide conversations between users, from #fridayfeeling to #GEElection2017, anything that is popular has its own hashtag. So why is it important for you to be involved? The beauty of hashtags is that they allow an easily follow-able topic. That means that you or your customers can follow the hashtag to not only see what is being spoken about in that moment but also follow it through a journey over time. It allows your content to be discoverable and increases your chance of engagement. What this means for your business is that you need to get into using key words as hashtags in order to either generate or join in with an existing hashtag, and allow your potential customers to find you. These are as simple as they sound- hashtags created from your brand name, slogan, all things associated with your brand. As many as 70% of hashtags used on Instagram are branded- now that’s a lot! 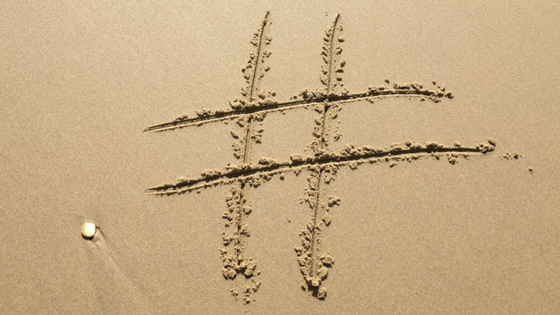 Branded hashtags are important as they link directly back to your brand and your business. This is huge for brand awareness. As I mentioned before people are able to follow the journey of your business and easily discover anything related to your brand. Community hashtags are based on a much more general topic, something that your product might relate to but is not directly specific to your brand. For example, the makeup brand could use the hashtag #makeup. This is a generic topic that people will search for, and as a result, your make up brand will show. Community hashtags are great for reaching a wider audience, people who may not yet be aware of your brand but are searching for similar topics. That’s not to say you should use hashtags about just anything that is popular. Obviously, they must relate to what you’re promoting or showing otherwise they’re pointless, right? If I’m honest this shouldn’t be too difficult. It’s always best to use a mix of both branded and community hashtags so you can reach as many people as possible. In terms of brand hashtags, you should hashtag things such as your brand name and slogan, try to come up with something catchy that people can latch onto, that seems to work best! For community hashtags the best thing you can do is search for what people are already using. When you search for hashtags on Instagram it shows you the amount of posts that also contain that hashtags and this can give you a good indication of what hashtags are working better than others. For example, when you type in the #makeup it appears with the ‘top’ #s relating to makeup, and so these are the most popular, and definitely the best for you to include! If you’re struggling to come up with ideas of things relating to your product that people may be searching for then it is always worth checking out your competition. Have a look at other businesses in your industry and see what things they’re hashtagging and if this is working. Failing all of that you can use a third party tool. There are a lot of great tools that you could try, the most popular being Hashtagify. This works by using one keyword and discovering other words related to it that are popular and being used. It will generate a list of hashtags that are similar to the keyword that you can use. If you still need help with your social media strategy, check out our services!